Mission/Charlo grappler Isaiah Allik takes down an opponent during the Owen Tournament. 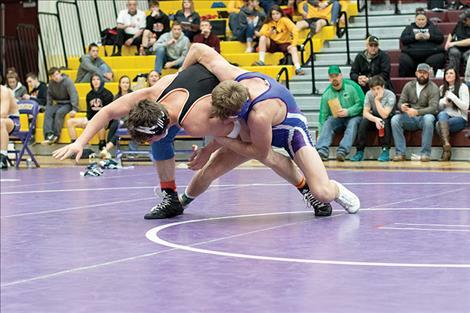 SUPERIOR — Ronan, Polson and Mission Valley grapplers battled on the road this past weekend. The combined Mission and Charlo teams, known together as the Bulldogs, had two wins with Walker Murphy (120) and Isaiah Allik (170) capturing individual titles to help the Bulldogs to a third-place finish during the Bob Kinney Invitational in Superior on Saturday. Murphy and Allik both won their championship matches by pins. Murphy pinned Dean Kellogg of Whitefish in 3:55, while Allik pinned teammate Troy Matt in 1:10. Matt (170), Isaac DuMontier (152) and Miles Anderson (250) each took second-place finishes. Darwin Adams (145) placed third, and Cole Gilleard (138) finished fourth. The Polson Pirates and Ronan Chiefs made their way to the Ross J. Richardson Memorial Gym in Butte to compete in the Mining City Duals. The Chiefs fell 42-30 to Dillion, 67-6 to Great Falls and 53-18 to Helena Capital. The Pirates fell 52-24 to Helena High and 51-24 to Billings Senior, but they had a gutsy win 39-35 on Friday over Havre who are the four-time defending Mining City Duals champions. On Saturday, Polson fell to both Bozeman and Skyview by a score of 48-30 and dropped a close 39-36 match to Frenchtown. Ronan finished the tournament falling 42-9 to Colstrip and 36-30 to Hellgate.